The leaders of the European Union have agreed on how to deal with the refugee immigration after a marathon of meetings this week. The European block has agreed to create asylum processing centres. “All measures in the context of these controlled centres, including relocation and resettlement, will be volunteer”, the combined publishing said. The leaders have also agreed to tighten up their external borders and to increase the financing to Turkey, Morocco and States in northern Africa to prevent immigration to Europe. Immigration centres must be installed in EU countries to process asylum requests. According to the BBC, Italy – the entry point to thousands of refugees, mainly from Africa – has threatened to close their whole agenda in case they didn’t receive any help. However, there have not been any details about which countries would host the centres or welcome refugees. The president of France, Emmanuel Macron, has stated that centres will be in countries where immigrants first arrive in the EU. “We have reached a certain balance between responsibility and solidarity”, he concluded. The number of people who enter the EU illegally has decreased 96% since the 2015 peak, according to the European Council. Most Britons want more intelligence in border control so that it will allow the end of general restrictions to immigrants that have been used by the government over the last 10 years, a new study has revealed. The exclusive research by The Independent has shown an enormous support to the Home Office secretary, Sajid Javid’s recent measure of removing NHS professionals from a limited visa system for qualified workers. Airbus has warned that it might leave the United Kingdom if the country leaves the common market in the European Union and the customs union without a transition deal. The company employs 14 thousand people in 25 places in the United Kingdom – and around half of this number in Wales. The UK government has stated they are confident in getting a new deal to all industries, but the Welsh government says this situation is “extremely concerning”. The forecast of some specialists on the negative and chaotic impact that Brexit could bring to the United Kingdom has apparently started materialising. According to The Independent, the government has been alerted on the impact Brexit will have on the economy: official numbers from the government’s office reveal that immigration has decreased, while the number of job vacancies is still high. Statistics show that population growth has plummeted to the lowest rate in a decade, after a decrease in 12% in the number of immigrants the year after the referendum. There has also been a decrease of 43% in the number of people who immigrated to look for work in the past year. Politicians, charities and companies have released a warning to congressmen about the negative effect Brexit is having on the workforce, insisting that the current decline in the number of EU workers cannot be easily reverted and may lead to economic problems. The National Office for Statistics, that released the numbers, has stated that the EU must be one of the main boosts for change. In the 12 months after Brexit, there has been an increase of 9% in the amount of people who have left the United Kingdom, and a decrease of 12% in immigrants that entered the country, according to the numbers. The Home Office did not wish to make any comments. The British government detained over 850 people between the years of 2012 and 2017, some of which were legally living in the United Kingdom. According to the newspaper The Guardian, as a result, authorities were forced to pay over £21 million pounds in reparations. The numbers published show that there have been 171 cases of unfair immigration detention in 2015-16, causing the payment of reparations that totalized £ 4,1 million, and 143 cases in 2016-17, adding up to £ 3,3 million. Between 2012 and 2015, a total of £ 13,8 milllion has been paid to over 550 people after a period of illegal immigration detaining. The document revealed by the newspaper also shows that bonuses have been paid to senior and junior officers from the Home Office, for the accomplishment of forced removal targets from the country. The numbers of detentions do not provide details of who was mistakenly detained, although it is possible that these numbers include some individuals form Windrush that were wrongly sent to immigrant removal centres or prisons before deportation. There are known cases of individuals from Windrush that were almost deported, like Anthony Brian, who was sent to an immigrant detention centre last December and booked by the Home Office a flight back to Jamaica, a country he had not visited since he was 8 years old. A last-minute intervention by an immigration lawyer got his seat in the flight cancelled and he was released from detention. The Home Office secretary, Sajid Javid, has promised to provide numbers on how many people from Windrush were wrongly detained; he has already acknowledged that 63 people from Windrush have been deported by mistake. Brazilians with dual European citizenship enjoy the privileges as any other citizen of the countries that are part of the European Union. However, many who have a European passport are in doubt as to the type of application they must make to officiate their residence in the United Kingdom. To date, the British Government does not require European citizens to apply for residency in the country to prove their right to live and work in the United Kingdom. However, with Brexit, those who already have their situation regulated will certainly avoid future problems. Among those who will apply, it is very common to confusion between permanent residence and Registration Certificate. So stay tuned and take your questions. Everyone who has citizenship from any country belonging to the European Economic Area (EEA) or Switzerland can obtain the Registration Certificate, which can be used as a proof of the right to live in the UK. The certificate can be very useful in some circumstances to prove your immigrant status. To apply it is necessary to prove that the applicant is working as an employee or autonomous, studying or that he is financially self-sufficient to pay his bills in the country without a request for benefits. As there are larger requires for students and people economically self-sufficient. Permanent residence in the United Kingdom is also applicable to all European citizens living in the country. However, it is necessary that they have lived for at least five years continuously in England and that they have qualified within the hypotheticals above. After that period, everyone is entitled to permanent residence. It is necessary to prove the period of stay over the years through contracts of employment, rent, etc. The whole process lasts on average up to 6 months, but the Home Office usually gives priority to these cases. LondonHelp4U is an expert on applications for permanent residency and Registration Certificate in the UK. Our consultants provide the necessary assistance throughout the process, from the selection of the documents to the delivery of the certificates. Around 100 thousand people protested this weekend in favor of the UK remaining in the European Union. The day marked two years since the referendum that favored Brexit happened. The demonstration took place from Pall Mall to the Parliament Square, filling the capital’s streets with signs and European Union’s flags. The demonstration was the largest since the voting in 2016. The leader of the Democratic Liberal Party, Vince Cable, told the crowds that Brexit “still doesn’t have a deal” and that the decision of leaving the EU could still be reversed, while the Green Party’s co-leader, Caroline Lucas, said Brexit “will be a disaster to this country”. The protesters also demanded more participation of the British population in voting the acceptance or refusal of the deal that is being held between United Kingdom’s prime minister, Theresa May, and the European community. Last week, the secretary of foreign relations, Boris Johnson, asked Theresa May to deliver a “complete British Brexit”, lined up with the declarations of the secretary of International Commerce, Liam Fox, who believes the United Kingdom was not bluffing about being prepared to leave the negotiations with Brussels. Fox highlighted that the economic impact of a “no deal” Brexit over the members of EU would be severe, while Boris Johnson added that the British population would not tolerate a “soft, flexible and apparently indefinitely long” Brexit. 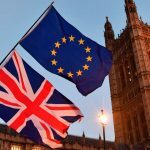 A research carried by the Centre for European Reform (CER) indicated that Brexit had already made British economy 2,1% weaker than if voters had decided to remain in the EU.